A lot smaller than i was expecting it to be inside. The place has a great commanding location on the main road and is handy for the railway station. Worth a visit for a quick one. Visited 3 Dec 2011. Pleasant traditional old style pub. Doom Bar not exceptional. The two female bar staff were considerably more interested in the "regulars" at the end of the bar. However we did not stay to eat as there were only half-hearted vegetarian choices. Nothing wrong, but not special either. Fab pub with accomodation, serving real ale like The Rock - Doom bar, Skinners - Betty Snogs, all branded spirits and bottled drinks, wounderful selection of fresh food in the restaraunt and bar, A big surprize was the bedrooms are being revampt. Bathroom totally refitted and bedrooms with new features and total refit. Stayed for a week in May 2011. Did miss the head of the household however our Ted Amor ! But Steve and Avril are keeping the family business up to its normal standed with plenty of new ideas. Two great chiefs that can knock up any meal you wish with a little notice. The full English breakfast is a must for anyone. Free parking in the middle of Newquay has got to be a big bonus. Thanks to you all at the Griffin our stay was most rewarding. 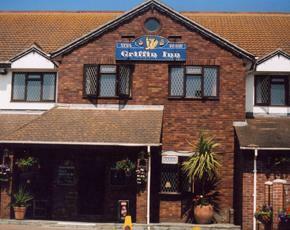 I have been staying at the Griffin for over 25 years. A few times per year. It could of been a couple of days or a week. Anyone that can put bad comments about the Griffin is totally being malicious. I have no complaints of the Griffin. I just cant fault it. The only thing I would say is : when the night club turns out up the road at the weekend it can be a little noisy especially if you wanted and early night. You are on Holiday! join in the fun! A great pub and hotel wound'nt change it for anything. What a shame... visited this pub/restaurant in May and received excellent service. But a revisit in October met with an extremely rude manageress who has absolutely no concept of how to deal with customers. Absolutely appalling service.,rude, offensive, and totally disinterested in customers. We took our seats and waited 15 minutes before we went to find someone to serve us. The Bad move. Met with a very rude response. It was apparent that our best course of action was to politely leave before we made our order. The manageress's response..... couldn't care less..